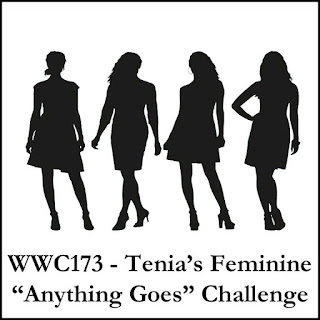 This week Tenia is hosting our Feminine "Anything Goes" challenge at the Watercooler Wednesday Challenge. 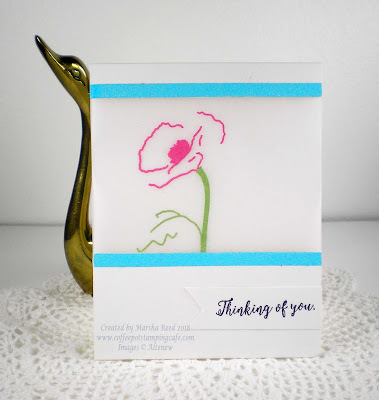 My clean and simple design focuses on using embossing powder to add color to your card. It was fun using the different colors of embossing powder and using sticky tape to add the turquoise powder. It's an easy way to adhere the powder and heat emboss it. For all of our challenge details and to share your project, visit the Watercooler Wednesday Challenge by clicking the image below. We’d love to have you join us. You have until Monday, June 11th at 6:00 p.m. Central Daylight Time to link up your project. Sorry I didn't have a chance to comment on your card last week Marsha but wanted to let you know I really liked the embossing with colour you shared. I'm really impressed with how vivid the colours are and make the flower fairly pop off the page. Beautiful! Thanks for sharing. Thanks, Penny! It's tricky to emboss on vellum but at least I didn't burn it.